The story of Etal Castle began in 1314 when Robert Manners was granted a licence to fortify his home for protection against Scottish raiders with the addition of curtain walls, corner-towers and a gatehouse. Etal Castle was thrown into the forefront of national events in 1513 when an army of 30,000 Scots led by James IV invaded England. Etal Castle fell to the Scots but in the bloody battle which ensued on nearby Flodden Hill the invaders were defeated. In 1547 the castle was transferred to Royal ownership. 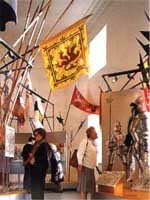 An award-winning exhibition tells the story of the Battle of Flodden and and of the border warfare which existed here until the union of the English and Scottish crowns in 1603. The remains of this early 14th century border castle dominate the picturesque village of Etal.